This was the year of series conclusions. I started 2016 reading the final book in Marissa Meyer’s The Lunar Chronicles, Winter. While the character Winter’s story didn’t engage me like Cinder or Cress’s, overall the book was really good with vivid descriptions and fast-paced action. But some were more personal. NAF alumna Kat Heckenbach published the final book of her YA fantasy Toch Island Chronicles, Legacy Rewound. I had the privilege of beta reading it. Wow! She knocked it out of the park. Very much worth the wait. Nadine Brandes also finished her dystopian Out of Time Series, A Time to Rise, it too was every bit as good as I’d hoped. A very satisfying ending. But it wasn’t only wrapping up beloved series for me. I was about new and new-to-me authors as well as a reread or two. I discovered exactly why Brandon Sanderson and Jim Butcher come up in conversation so frequently. Between Sanderson’s Mistborn series and The Rrithmatist as well as Butcher’s The Aeronaut’s Windlass, I enjoyed some exciting stories in steampunkesque settings. Jim Butcher reminded me how much I love a good mystery. Harry Dresden the mystery-solving wizard is a mashup of cozy mystery and urban fantasy. I revisited a couple of favorite authors. Morgan Busse’s steampunk Tainted was great. I also had the pleasure of beta-reading Kerry Nietz’s updated version of his stand-alone dystopian, Mask (this links to the 2016 version). It was really good the first time, but the new version (including the redesigned cover) is even shinier. As for new-to-me authors, mysteries were a big part of my 2016 book pile. 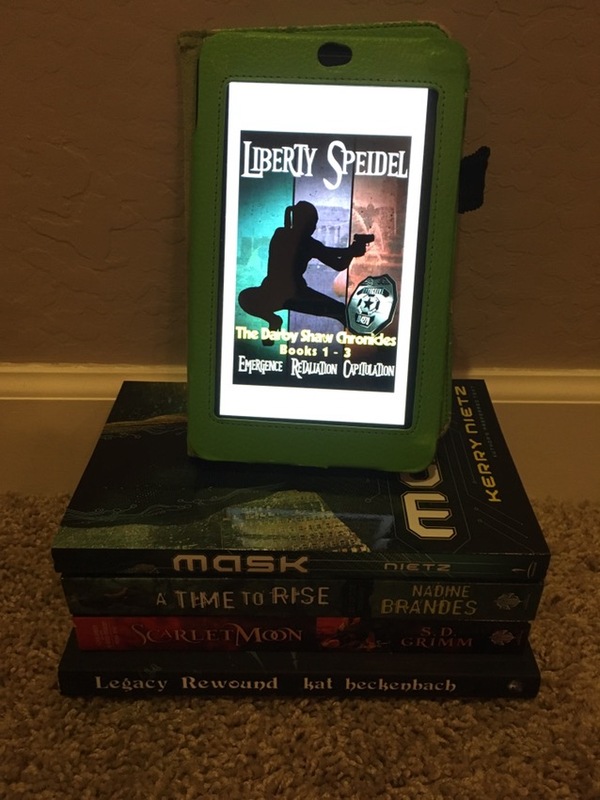 Besides Butcher, I read Liberty Speidel’s Darby Shaw Chronicles (this links to the boxed set of the first three books). She mixes mystery with speculative fiction. In Darby’s case, she’s not a wizard but a detective who happens to be a superhero who can revive murder victims. Yes, the books are that cool. Picking favorite books is always a hard choice. All of the above are in the running. Another contender is debut author, S.D. Grimm’s Scarlet Moon. It was definitely the biggest surprise. I knew I’d like it but had no idea how much I’d love it. It also has one of the best opening scenes. What were your favorite books of 2016?